Bazooka Joe and his Gang | 'TAIN'T THE MEAT… IT'S THE HUMANITY! In the early 1950’s American gum manufacturer Topps decided to revamp its gum brand Bazooka, “The Atom”, Bubble Gum. Gone were the old packets of six pieces for 5¢, replaced instead with the more affordable, kid-friendly one piece for 1¢. Gone too was the gum’s nondescript and nameless cartoon mascot. And in a stroke of marketing ingenuity they began including small wraparound comic strips with each piece of gum that featured the brand’s new mascot, an eye-patch wearing street kid named Bazooka Joe. Published by Abrams Comicarts Bazooka Joe and his Gang was originally released to celebrate the character’s 60th anniversary, but now that Topps have announced that they are retiring Joe and his gang the book now doubles as a fitting tribute to one of the most recognisable advertising icons of the 20th century. Although it measures only 7.5 x 6 inches don’t let the book’s small size fool you, it’s stuffed to the brim with goodies – as soon as you pick up the book you know you’re in for something special. The dust jacket is printed on grease proof paper similar to the gum’s original outer wrapping while the hardback covers are reminiscent of the bright pink gum itself. 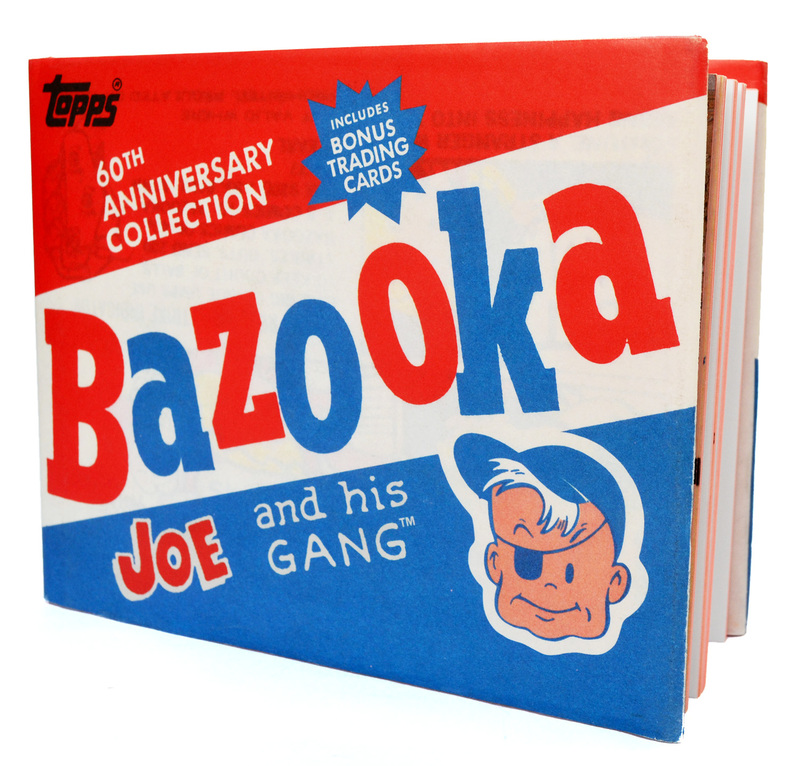 At 228 pages Bazooka Joe and his Gang features six informative text essays, covering almost every aspect of the creative process behind the brand’s re-launch in 1954. Talley Morse, son of original Joe artist Wesley Morse, and the inspiration for the character himself, shares his memories of his father. Morse senior was already an established artist – he worked on posters for the Ziegfeld Follies, illustrated the famous Copa Girl for the Copacabana Club in New York and even knocked out the occasional Tijuana Bible – when he was commissioned by Topps to create Joe in 1953. Over the next decade, until his death in 1963, Morse drew hundreds of comic strips (all of which were unsigned) featuring Joe and his gang, many of which remained in circulation for decades. Former Topps creative director Len Brown also weights-in on the character’s creation as does Jay Lynch, long-time freelancer at Topps, while cartoonist Bhob Stewart discusses the brand’s relaunch in 1983. Several nuggets of Joe trivia are unearthed, from explaining the origin of Joe’s eye-patch (inspired by well known advert from the early 1950’s) to the creation of the cheesy fortunes that accompanied each strip. Comic book historian R. Sikoryak rounds off the book by detailing the character’s considerable impact on popular culture. Hundreds of images are reproduced, covering every aspect of the brand’s marketing and promotion. Many of Morse’s strips are reprinted along with their original artwork, as well as packaging and box art. Original print adverts are included as well as a profusion of promotional material, such as badges, competitions and movie tie-ins. The book really is stuffed with goodies, all aided by the book’s clean design and layout. But the book doesn’t just concentrate on Joe – his gang also feature prominently. The sailer cap wearing Butch, the turtleneck-challenged Mort, Joe’s sometimes girlfriend Janet, his cowboy obsessed little brother Pesty and his dog Walkie Talkie are all included. (And speaking of Mort, I remember being a little confused by his character when I read the strips as a kid. I just couldn’t quite figure out what was wrong with him as that bright, blood-red smear below his nose made him look like the victim of some terrible accident. It certainly didn’t occur to me that he was wearing a jumper pulled up too high). For me the highlight of the book must be the section on the free gifts. In order to cement the bond between kids and their brand, Topps gave Bazooka Joe fans the opportunity to exchange their wrappers for ‘valuable’ free gifts, such as watches, compasses, walkie-talkies and rings. If you were of a mind you could even send off for a hunting knife or a hatchet. As a kid living in the UK I clearly remember wondering what the gifts would be like, but since the offers were only valid in the US there was no chance for me to find out. Post wrappers and American money to the US? They may as well have asked me to send them to the Moon. Lastly, also included with the book are four trading cards that reprint classic cartoons by Wesley Morse. Their inclusion is a nice touch although I’m not sure who the reader is meant to trade the cards with. Priced at just £13/$20 (although you can easily find it cheaper if you look around) Bazooka Joe and his Gang is a well produced and loving homage to one of the legends of 20th century advertising. Fans of the original comics will find a lot here to entertain them, as will fans of 1950’s American graphic design. 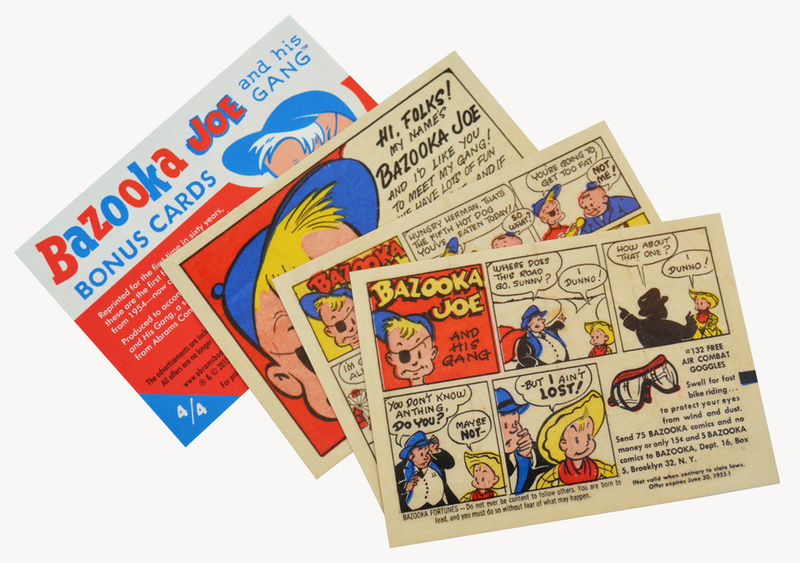 Bazooka Joe and his Gang is a nostalgic reminder of a by-gone era where, for a penny, kids could get a mouth full of gum, a quick laugh and learn their fortune. And, if of a mind, they could exchange a handful of gum wrappers for a hunting knife or axe. Halcyon days indeed.